Get Your Carpentry and Joinery NVQ Level 2 Using The SuperSkills Fast Track Route! This qualification is the CSkills Awards Level 2 NVQ Diploma in Carpentry and Joinery via a Fast Track route and will lead to you being able to get your Blue CSCS “Skilled Worker” Card. If you have FIVE YEARS EXPERIENCE or more as a Carpenter, SuperSkills offers NVQ Level 2 Carpentry and Joinery Assessment via a Fast Track practical assessment route for you to get your NVQ. If you are a Carpenter, but have less than five years experience, you will still be able to get your NVQ Level 2, but we will take you through On Site Assessment and Training. See details of all our Carpentry and Joinery NVQ Assessments here. The EXPERIENCED WORKER PRACTICAL ASSESSMENT ROUTE (EWPAR) approach to Carpentry and Joinery NVQ Level 2 is the best assessment process for Carpenters who have considerable experience. We only need you at the assessment centre for one day, during which you will demonstrate your Carpentry skills in a series of practical exercises. The remainder of the evidence for the assessment comes from a detailed interview about your work and “Witness Testimonies” – references signed off by people who are in the trades and know your work. All National Vocational Qualifications need assessment of the way you operate in the workplace. Experienced Worker Practical Assessment obtains this evidence by getting people you have worked with and for providing references to say you are skilled as a Carpenter. To find out how getting your Level 2 NVQ Carpentry and Joinery Assessment via Experienced Worker Practical Assessment works, have a look at our handy guide. Firstly, fill in the form on the left or call us on 01845 527 445. We will advise you if you have sufficient general Carpentry experience to take your NVQ Level 2 in Carpentry and Joinery using the experienced worker route. We will then meet with you at the SuperSkills Centre to carry out the Carpentry and Joinery Assessment. Between the exercises, you will discuss your experience and work you have done with the assessor, who will lead you every step of the way. 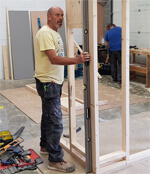 People come from all over the country to get their Carpentry and Joinery NVQ Level 2 at SuperSkills in Thirsk, Yorkshire. We can make arrangements for accommodation if you need this. See some of the local accommodation available in Thirsk here. We pride ourselves on a quick, simple and convenient process that makes getting your NVQ in Carpentry & Joinery as simple as possible.